David Byrne acquired fame as the lead singer and guitarist of Talking Heads, one of the downtown New York bands that helped sweep punk and new wave to prominence in the late ‘70s. His latest book, How Music Works does not qualify as an autobiography; instead, his career as a musician serves as an entry point for a more general discussion about music. Byrne wants to teach and conjecture, discussing music’s connection to human origins, its history, its evolution, its strengths and its weaknesses. Each chapter, Byrne tells us, “focuses on a distinct aspect of music and its context. . . The chapters are not chronological or sequential.” While Byrne suggests “there’s a flow to it,” there’s a lot of loosely related material here, and the book flows … but slowly. As Byrne tells it, his whole career—with Talking Heads and solo—can be seen as one massive process of stripping everything back and building it up again in new ways. He describes the thought process that drove many of his decisions. Byrne’s frank discussion of his artistic process illuminates the cat-and-mouse game that often characterizes success as a musician. How do you gain attention and set yourself apart in a world full of creativity? Byrne actively worked to disregard convention, purposely acted in ways considered strange or off, pretended that even the most basic building blocks of pop music—a drum set and a lead singing line —did not exist. He constantly incorporated new sounds, either by working with a revolving cast of collaborators who brought different ideas to the turntable or by appropriating forms in other styles of music. Talking Heads’ (and Byrne’s) most critically lauded album, Remain In Light, also came from the process of stripping things down, even though it resulted in a fuller sound that required a much larger live band. Byrne and Eno took the lessons of their My Life recording sessions and brought them into a full band setting with the rest of the band. As Byrne describes it, “One or two people would lay down a track, usually some kind of repetitive groove. . . Others would then respond to what had been put down, adding their own repetitive parts, filling in the gaps.” Repetition and free response formed the basis of very simple tracks – “Often in these songs there was no real key change. . . one could still imply key modulations. . . we had basically abandoned the rules we had previously accepted. . .punk rock was celebrated for needing only three chords, we had now stripped that down to one.” As Byrne acknowledges, he took a roundabout and convoluted path to find the foundation of many blues tunes and a lot of James Brown funk: a single chord. Byrne writes about his own music and career for barely a quarter of How Music Works. 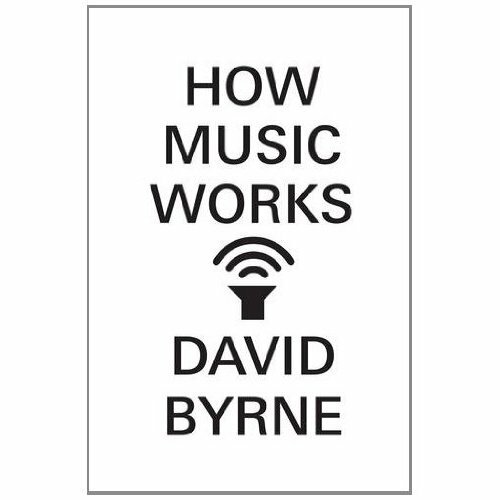 The bulk of the book contains Byrne’s ideas and speculations on diverse subjects he believes relate to music’s context: the ways “Technology Shapes Music;” the financial aspects of making music in today’s market; and the importance of amateurs to music-making. One chapter titled “Harmonia Mundi” (a play on the name of a book published by astronomer Johannes Kepler in 1619) gets into the deep stuff, asking questions like “…do we need music? Does it even matter? Where did it come from?” and “What did ancient music sound like?” While some of Byrne’s discussions and meditations interest, others read like a textbook or school lesson, with little sense of narrative or movement. Byrne certainly reads a ton, and he wants to get everything he’s read into the book. He would have benefitted from tight editing and a lot less wishy-washiness. In the 65 pages discussing music and technology, Byrne reminds his readers again and again that technology has both pros and cons. It’s good he’s not narrow-minded; few now find diatribes about how the mp3 represents the downfall of mankind very interesting. Maybe there’s a point, and maybe there’s not. Either way, Byrne never gets to it. Byrne’s a really talented musician. Does that mean he’s an interesting writer? Does writing a killer hook mean a musician can write a good book? Singers also like to write books about their own careers. For many musicians, creating an autobiography answers the same impulse that caused them to make music in the first place: the need to say something about themselves. Perhaps there’s a reason that most musicians don’t stray too far from the things they know in creating music, or describing that process. Making music comes more easily than other expressive forms. Writing about the music may seem like a natural extension. Byrne does fine when he sticks to his own career. But when not focused on experiences in the studio, his writing loses its firsthand intensity, its narrative coherence, and a good deal of its power to interest. Of course he doesn’t. He can do whatever he wants. But the reader may not be greatly entertained with his choice. Elias Leight is getting a Ph.D. at Princeton in politics. He is from Northampton, Massachusetts, and writes about music at signothetimesblog.